"Have you ever heard anything about God, Topsy?" The child looked bewildered, but grinned as usual. "Do you know who made you?" "Nobody, as I knows on," said the child, with a short laugh. The idea appeared to amuse her considerably; for her eyes twinkled, and she added, "Don't think nobody never made me. I ‘spect I growed"
After reading more issues of Captain America than is remotely good for my sanity I have come to the conclusion that Steve Rogers is indeed a folk-hero. No-one created him; but somehow, in 70 years of story telling, he grew. Spider-Man is also a folk-hero. He's passed through many creative hands and people who've never read a Spider-Man comic know who Spider-Man is. But Spider-Man has, and I think always will have, an ur-text to go back to. One writer may go right back to Steve Ditko for inspiration; another may be looking at last month's episode, which is copies from someone who was copying from someone who was copying Ditko, but however Ultimate or Superior he becomes, Spider-Man is always to some extent an Amazing Spider-Man #1 - #38 tribute band. Captain America, not so much. Oh, writers and artists genuflect at the shrine of Simon and Kirby, as well they might. But Simon and Kirby is where we started, not where we ended up. The apple-seed isn't the apple tree. 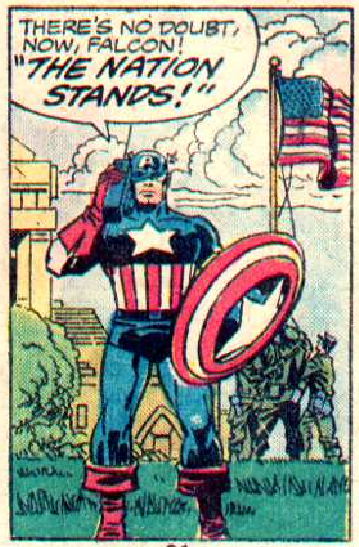 No-one remotely wants this months Captain America to look as if it came from 1942. Those issues are primitive and ground breaking and visceral and ever so slightly racist and probably not canon anymore. You don't need to go back to Captain America #1 or even Avengers #4 to find out what Captain America is meant to be like. You certainly don't need to read every single issue. That way madness lies. You already know. One possible definition of "myth" is that it's a story which can be told in a hundred different ways and still be the same story. When Jack Kirby drew that image of the skinny recruit being "inoculated" with the super-soldier serum, he created a genuine myth. When Stan Lee add the image of the man frozen in a block of ice, slowly melting, he gave that myth a tragic depth. None of the dozens of retelling of it is the real thing. Unless every retelling of it is equally the real thing. Maybe that's why the Bold New Directions never work. You can’t give Captain America a new girl friend or a new house or a new job any more than you can relocate Father Christmas to the South Pole and decide that he's going to shave off his beard. Oh, you could write a story in which that happened, and it might be a very good story, but 20 years later that story would be forgotten and the myth would have reverted to it's original form. The only way a myth can change is organically, from the inside, so slowly that you didn't notice it happening. That's also why there is so little distance between movie Captain America and the comic book character. Robert Downey Jnr and Andrew Garfield are playing characters somewhat inspired by Iron Man and Spider-Man. Evans is simply being Steve Rogers. That's all he needs to do. We all know who Captain America is. And finally; that's why very bad ideas seem to do the character so little damage. Twenty years from now, the weeks when Sam Wilson carried the shield will be a footnote to a footnote in the long, long history of Steve Rogers. Dimension Z will be so much scar-tissue. Captain America is who Captain America is. But none of that rings terribly true. Every frame of the Lone Ranger -- the recent movie version -- creaked with the knowledge that the Lone Ranger is an American Myth (exclamation mark exclamation mark). The Captain America movie hardly seemed to care about that angle. Maybe there's a hint of it in the first Avengers movie, what with Agent Coulson's picture cards. But it avoided the portentous. We didn't feel that Captain America was somehow symbolizing Captain America. We didn't feel that Being Captain America was what the movies were about. I was left with two overwhelming feeling after coming to the end of my ludicrous Captain America marathon. One: that Steve Rogers is a person. There has been wild talk from quarters about how the huge complexity of the Marvel and DC Universes meaning that they are, or are on the point of, becoming semi-sentient entities. (Philip Sandifier thinks; or finds it interesting to pretend to think; that Doctor Who is a sentient meta-fiction.) That's all a lot of nonsense. But it's true that folk song that's been passed down through many generations of singers takes on a form that any one individual singer finds it very hard to emulate. Improvisational performers sometimes report that personalities can emerge in a group that no one actor could have come up with individually. If one writer writes about a pretend person, and another writer makes a copy and adds a bit and another writer makes a copy and ads a bit; then would it be very surprising if what you ended up with was a character who seemed to exist, not in any one comic book, but somehow out there. That's the first thing I took away. Steve Rogers isn't a character in a comic, he's a person. And the second thing was this: he's a person I like very much indeed. Andrew Rilstone here. If you have enjoyed these articles, please consider pledging to pay 50p or £1 each time I write an article in the future. I know I'm asking a lot. But the price of blogging has always been high. If I'm the only person prepared to pay it, so be it. But I'm willing to bet I'm not.